My response to them? You don’t HAVE To get a bunch of flavoured proteins, you really don’t, especially if what you intend to use them in is food. You see, when it comes to cooking and food, you really don’t NEED any of the stuff most protein powders out there contain. You know, things like gums, artificial flavours, artificial (or ‘natural’) sweeteners, and soy (or sunflower) lecithin. Those things might be fine if what you want is to add water to your protein shaker, shake it, and end up with a shake. But when it comes to food, ingredients like the above are unnecessary – and sometimes even counter-productive! Counter-productive in the sense that, if you’re making things like Protein Fluff, for example, using a protein with a bunch of gums will make you end up with a toothpasty-feeling fluff. When it comes to sweeteners and flavours too, sure, you can buy a protein powder that tastes of cookies, cake, pie, etc. But that’s really restrictive in that if you want to use that same powder to make savoury foods or something else, you won’t be able to. You’ll then spend a lot of money on other flavoured protein powders when you could just have one and use it in multiple different recipes! 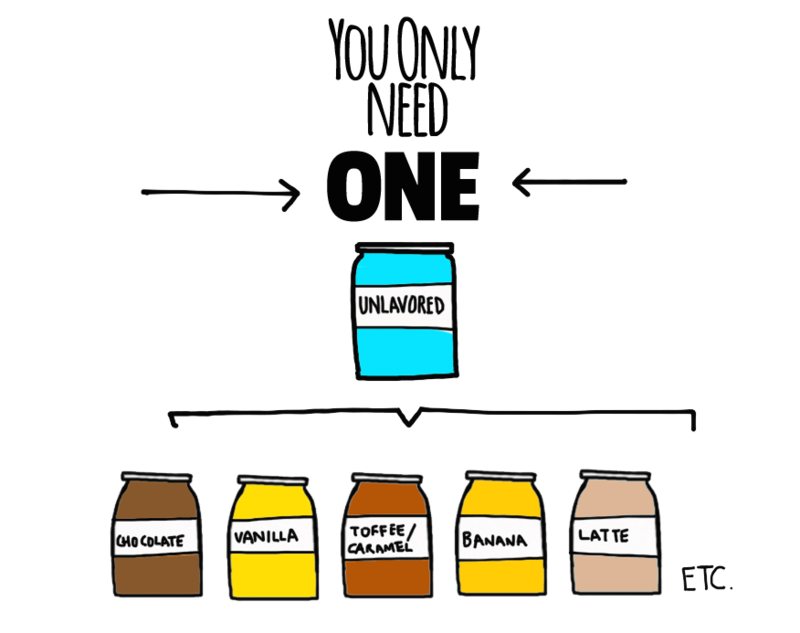 Flavouring your own protein powders is REALLY easy and fun too. 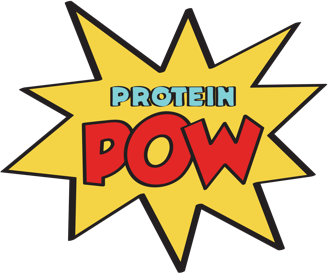 That’s where our Protein Pow Tree of flavors comes in! 7. Unflavoured protein powder + your sweetener of choice + chicory powder = a somewhat malty-tasting protein powder! Sweetening your own protein powders is great, I think, because you can do away with any and all artificial sweeteners that you may not like! For example, if you, like me, don’t like low-quality sweeteners with dodgy reputations like aspartame and ace-K (i.e. acesulfame potassium), you don’t have to ever consume them! Sucralose, erythitol, and processed stevia are a lot better options. They’re still lab-derived and in that sense ‘artificial’ (e.g. you can’t find them in nature they way you do in a bottle or pack) but they’re an OK low-carb option, in moderation of course. If you want to go fully ‘natural’ with your protein powders though, you can sweeten them using whole fruits (dates are amazing! ), whole leaf stevia concentrate (just know it’s pretty bitter! ), coconut sugar, date syrup, or honey/agave. 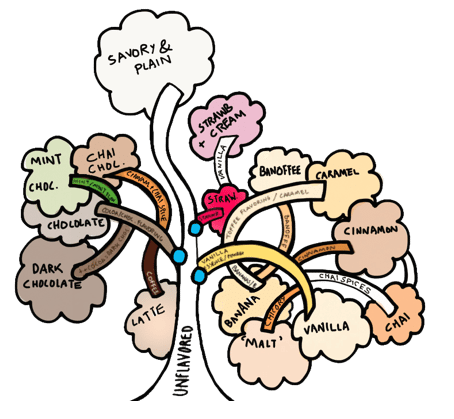 If you then want to go into the land of artificial flavours, well, the sky is the limit there. There are companies dedicated to producing a massive array of flavours! Check out, for example, FoodieFlavours.com. If you look at The Protein Pow Substitution Chart, you’ll see how having these two powder will enable you to make a massive array of both sweet and savory recipes. And you don’t need much else, you know? Bid farewell to the idea of getting a huge array of different kinds of protein powders. You just don’t need to turn your kitchen into a warehouse! They take up space, they cost money, and with the Tree of Pow you just don’t need them all.